You just might miss something. That's because the Tualatin High School boys basketball team can make things happen in an absolute hurry — just ask Newberg. The Tigers were enjoying a three-point lead over the Timberwolves near the midway point of the second quarter of Tuesday's non-league game. But, a peak at the scoreboard in the not-too-distant future showed Tualatin holding a 30-point advantage. 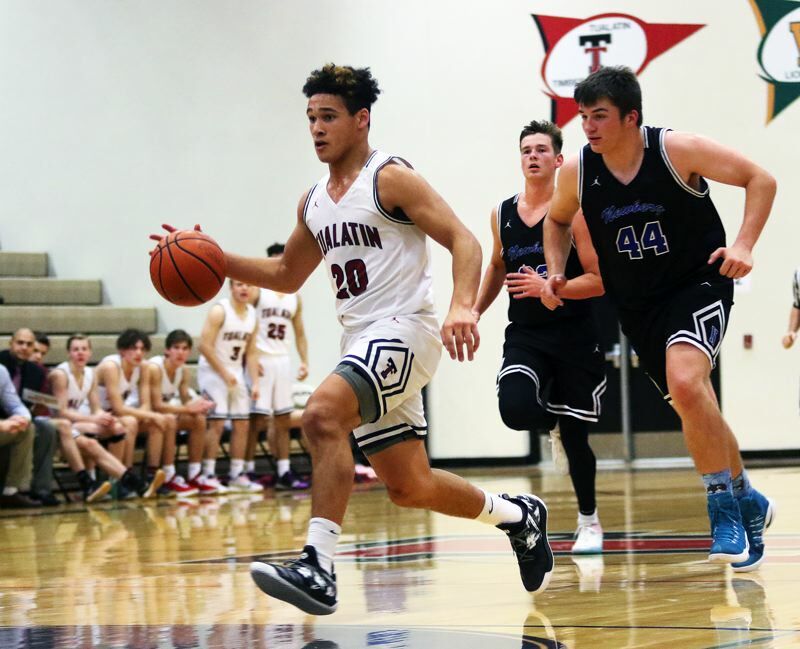 The Timberwolves, running, pressuring and shooting effectively — all in a hurry — ended up rolling to a 69-39 victory over Newberg in the contest played at Tualatin High School. 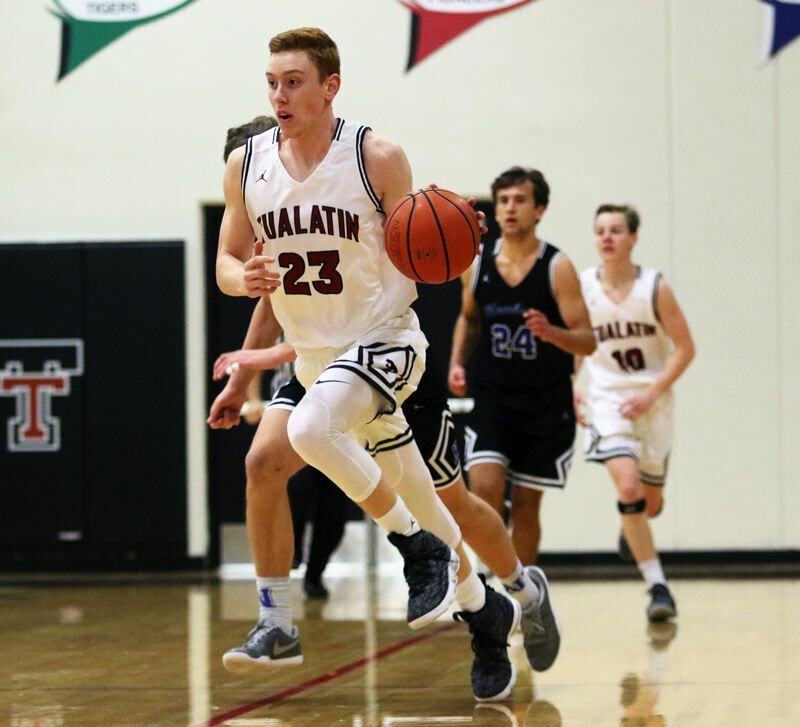 "We just have so many shooters, and so many athletic people, we can go on an 8-0 run in a minute," said Tualatin senior post Bridger Steppe, who scored 14 points in the victory. "No matter how much we're up, or down, we always try to go our hardest." 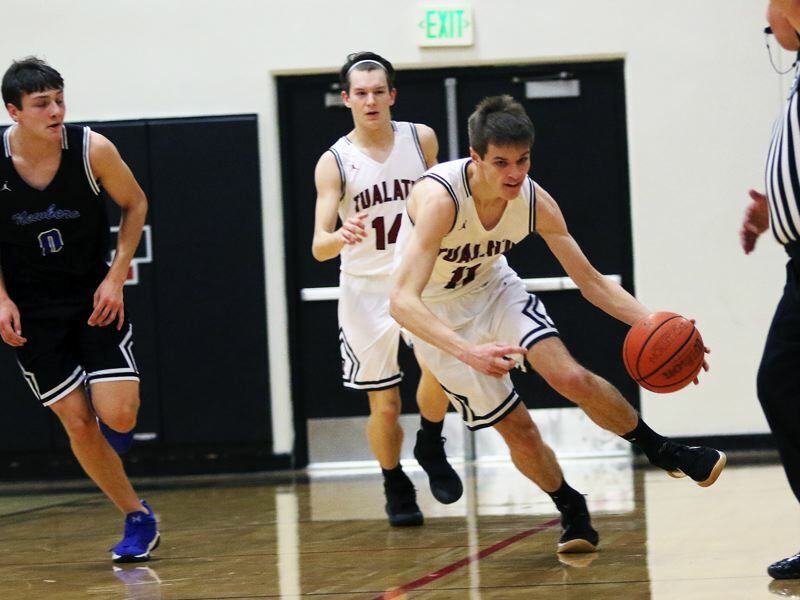 "We have a whole bunch of different scorers," said Tualatin senior guard Caden Dickson, who led a balanced Timberwolf scoring attack with 16 points. "You can't just shut down one guys. Everyone can do a lot on the court. We have good chemistry. We've been playing together since eighth grade. It's super nice, and it's all come together." With the loss, Newberg moved to 4-1 on the season. Tualatin, after losing its first-game of the season to 5-0 Silverton, picked up its third straight victory, giving the Wolves a 3-1 record. "We go hard in practice," Steppe said in regard to the fast start to the season. "We practice like we play, there's no screwing around." "After our first game, we realized we had to get our act together," Dickson said. "And, after we got those first-game jitters out, we realized that we can do a lot this year. I think we're kind of a sleeper team, but, with the scorers and athleticism we have, I think we can do a lot." 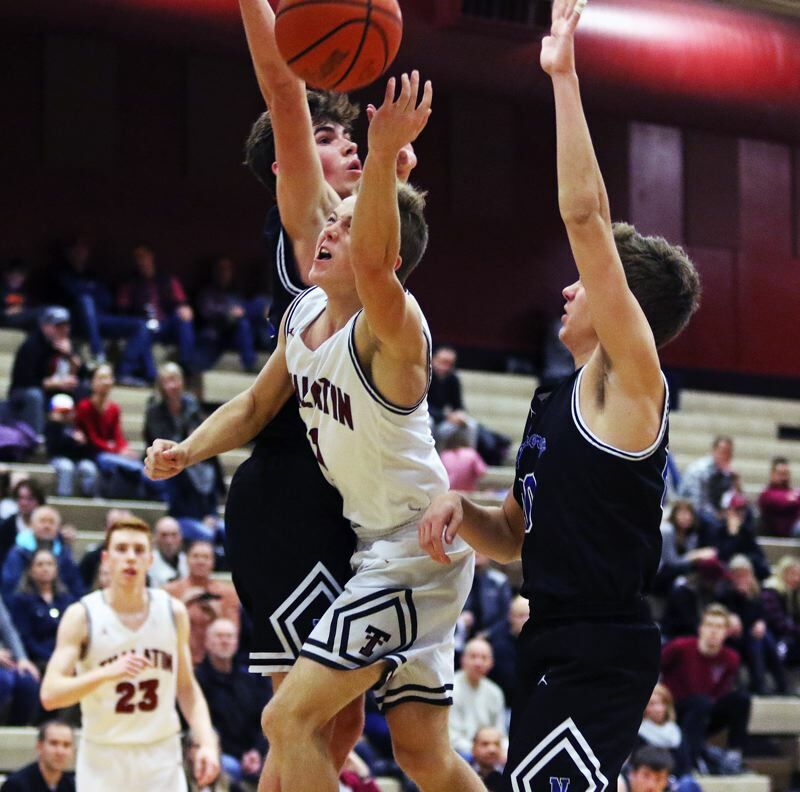 Tualatin, in Tuesday's game, held an 18-15 lead at the end of the first quarter, with Steppe scoring six points in the opening period. But Newberg rallied early in the second quarter. The Tigers, with senior Mitchell Allison sinking a 3-pointer, followed by baskets by both junior Luke Esmond and junior Jack Chlumak, came back to claim a 25-22 lead with 5 minutes and 7 seconds left to play before halftime. But the rest of the game belonged to Tualatin — in a very big way. In a time span of 14:33, covering the last 4:47 of the second quarter, the entire third quarter and the first 2:14 of the fourth quarter, the Wolves outscored Newberg by a 37-4 margin, giving Tualatin a 59-29 cushion with 5:46 left to play in the game. "We had a little bit of a slow first half, but we were able to get in our zone and we had a really solid second half and got a lot of buckets," Dickson said. "We ran through our offense and got good looks, and we were able to knock down the shots." The big run started back in the second quarter with a foul-line jumper by Steppe. Junior John Miller followed that up with a 3-point basket. Dickson then scored on a full-court drive after grabbing a defensive rebound. Steppe and junior Sam Noland followed that up with baskets of their own, helping the Wolves grab a 33-27 halftime lead. 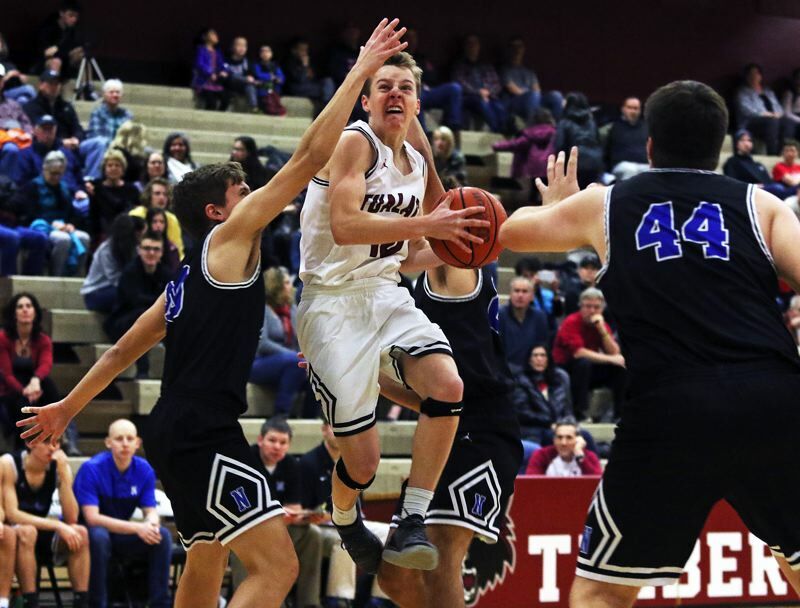 Tualatin's defense took over in the third quarter, allowing Newberg just two points, on 1 for 10 shooting from the field, while helping force the Tigers into four turnovers. Meanwhile, Miller sank a pair of 3-pointers and scored eight points in the quarter. Steppe scored four more points and senior Jack Rose connected on a 3-pointer while also having three rebounds and a steal in the period, as the Wolves would take a 52-29 lead to the fourth quarter. Tualatin kept rolling in the final stanza. Rose opened the period with a layup. Dickson followed with a 3-pointer and senior Jason Wisler scored on a drive to the hoop, giving Tualatin a 59-29 lead with 5:46 remaining. The Wolves would eventually take their biggest lead of the game, at 67-36, when Rose scored on a layup off a pass from senior Derek Leneve with 2:06 remaining, and they would cruise to the 69-39 victory. "It was a good win," Steppe said. "Our defense stuck to it, and we shared the ball around. That was a great team win." "Tonight was super fun," Dickson said. "When we get the offense going and clicking like we did, especially in the second half, it made it a lot of fun. We got good looks and knocked them down, that's when it's the most fun." Miller scored 15 points and eight rebounds. Steppe had 11 rebounds to go with his 14 points. "That's just how I play," Steppe said of his aggressiveness. "I try to get every rebound and fire up my team." Rose had nine points, six rebounds, two steals and two blocked shots. Leneve scored six points. 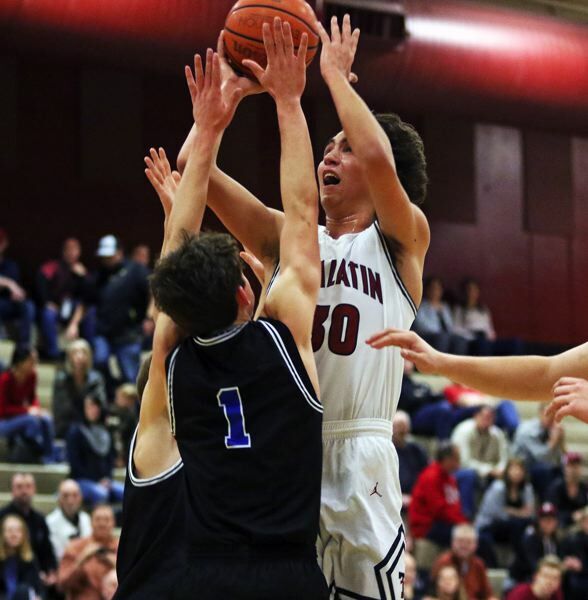 Tualatin, as a team, made 28 of 52 shots from the field, with six 3-pointers, and seven of nine free-throw attempts. The Wolves also outrebounded Newberg by a 36-22 margin. Chlumak led Newberg with 15 points, all coming in the first half. Allison added eight points for the Tigers. Newberg, as a team, made 16 of 54 shots from the field, with four 3-pointers, and three of five free-throw attempts. The Wolves will be back in action on Friday, when they face McMinnville at 5:30 p.m. in a first-round game at the Barlow Tournament. Tualatin will also play at the tournament on Saturday.